Launched on June 30, 2015, Apple Music streaming service has 27+ million paid subscribers in over 100 countries worldwide as of June, 2017. Though it’s so popular among music lovers, there are still some problems that users complain about. If you are an Apple Music subscriber, you must be well aware that all the Apple Music tracks come with DRM protection which is inconvenient for use and full enjoyment of the music. You are limited to a maximum of 5 devices to use Apple Music, be it your iPhone, iPad or Android phone with authorization. iOS devices under iOS v 8.4 and Android devices under v 4.4 are not able to access Apple Music. The user will lose all the songs when their subscription ends. These are some more restrictions, for example, user cannot play Apple Music songs on devices like iPod Nano/Classic/Shuffle and any other MP3 players like Sony Walkman. The DRM also prevents Apple Music songs to be used with video editing software or DVD authoring software for background music, which is frustrating. But now, you can get help from the TuneFab Apple Music Converter to solve these issues easily. TuneFab Apple Music Converter is a perfect utility which which help you unlock DRM protection from Apple Music, iTunes M4P songs and Audible AA/AAX audiobooks. The software can convert these protected files to MP3, M4A, FLAC, AU, AIFF, etc. Finally, you can make full use of your Apple Music playlist and songs. But it’s important to highlight that it’s for your PERSONAL use only. Strip off DRM from AA/AAX Audiobooks and convert to DRM-free MP3, FLAC, AAC, etc. How to use TuneFab Apple Music Converter? 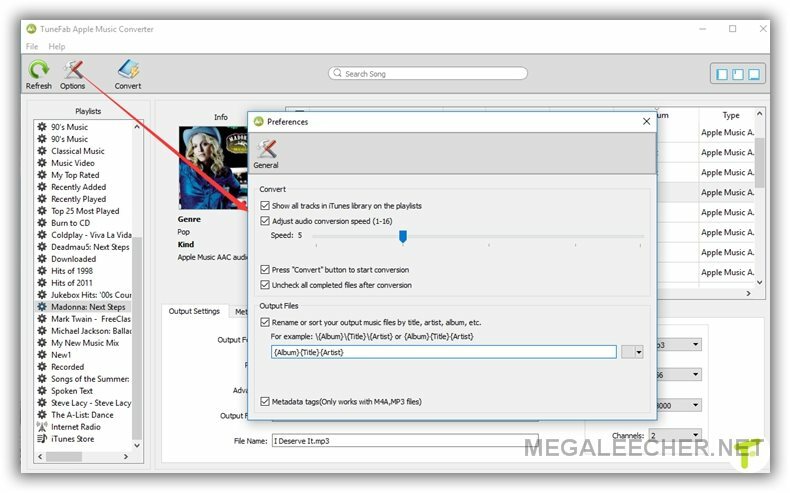 First, you need to download and install the TuneFab Apple Music Converter on your Windows or Mac computer, you must also have iTunes installed on your computer. 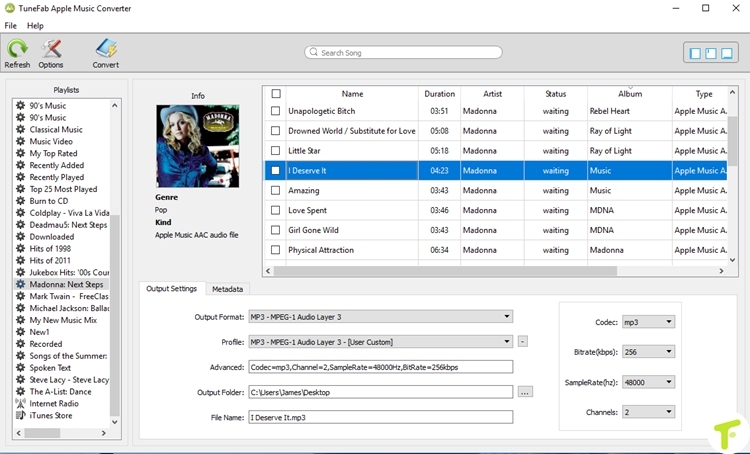 Once you open the tool, it will automatically scan and display your iTunes media files. On the left of the main interface, it displays all the different iTunes playlists. You can open the playlist that include the songs you want to convert. And go to the right section to select the songs. In the Output settings, you can choose the audio output format. This program offers 8 output file formats including: MP3, M4A, MKA, AAC, AC3, FLAC, AIFF and M4R. According to the format you’ve selected, the audio settings will be filled with default value. But you are still free to change them. You can also select the location where you want to store the songs after conversion. Finally, click on the “Convert” button on the menu bar. This program will start conversion immediately. The conversion time will depend on the number of songs. 30 days money back guarantee. 24 x 7 customer support. Usually, TuneFab Apple Music Converter offers a free trial. This is to help you check whether this software meets your need or not. And if you liked this program, you can purchase the full version for $39.95. There are many situations in which TuneFab Apple Music Converter will come-in handy, ultimately giving a user the freedom to enjoy music without restrictions. So, that’s why I highly recommend TuneFab Apple Music Converter to all of you. You should definitely go for it, and enjoy your Apple Music more freely, let alone it’s free for our readers now! God bless you. I really appreciate ! thanks, when I run it to convert my Audible audiobooks, it freezes during the process when launching iTunes. Not sure what cause this problem, but I really don't like iTunes. Hey guys, this software seems to very nice, but only got a chance to use the trial version. I'm still waiting on my access code. It seems great. Here I share another powerful Apple Music Converter you have not talked above. As for me, Apple Music Converter is a one-stop audio converter not only can help you convert Apple Music to MP3 but also allows you to convert Audible audiobook to MP3. Then you are able to listen to them on iPod, smart TV. Tunfab will not work with Win 10 MS app Itunes as MS have porked it.